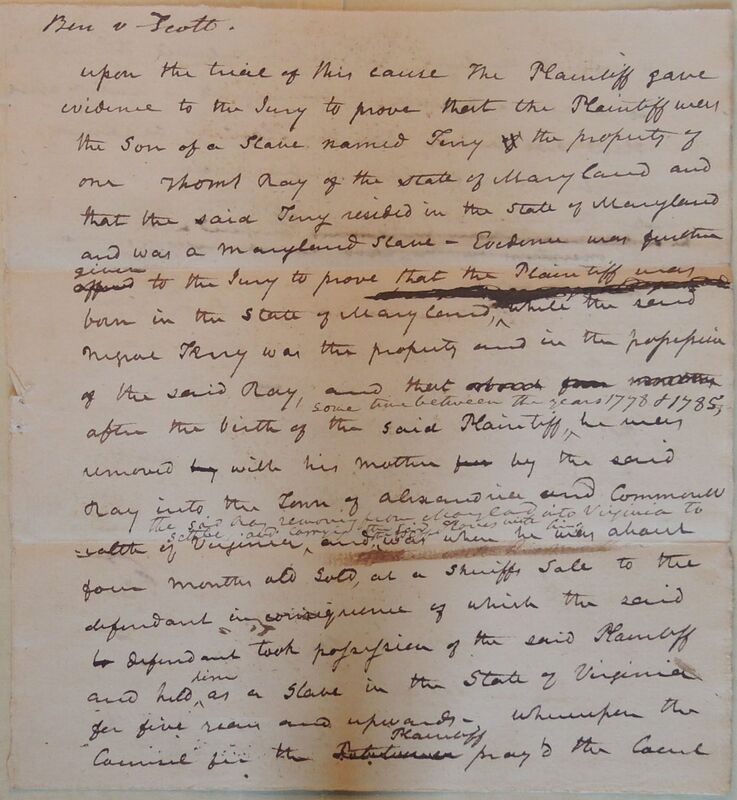 Upon the trial of this cause The Plantiff gave evidence to the Jury to prove that the Plantiff was the son of a slave named Terry of the property of one Thomas Ray of the state of Maryland and that the said Terry resided in the state of Maryland and was a Maryland slave. 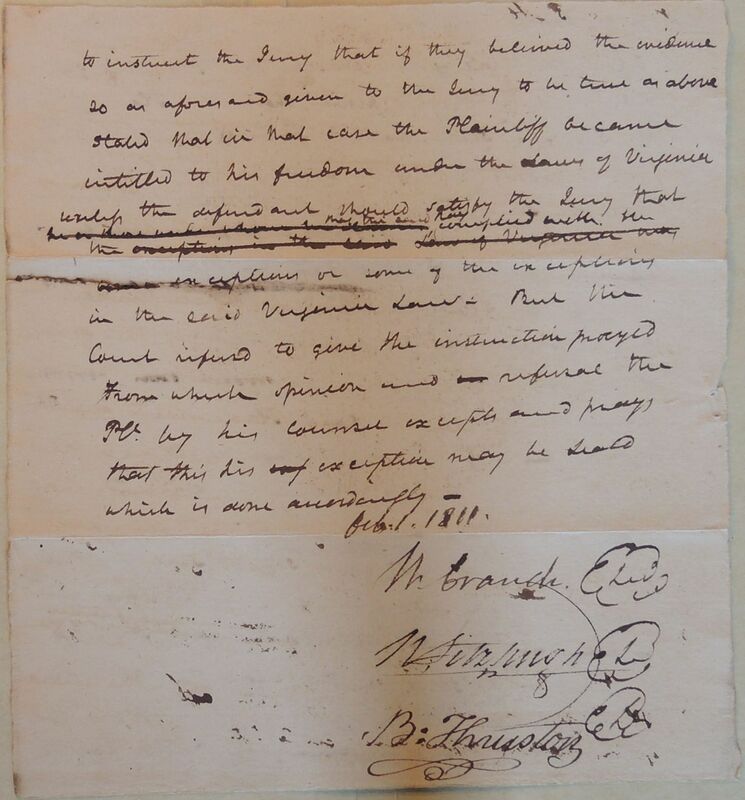 Evidence was firsthand offered given to the Jury to prove that the Plaintiff was born in the state of Maryland, [ink] while the said Negroe Terry was the property and in the possession of the said Ray, and that about from mother after the birth of the said Plaintiff, some time between the years 1778 & 1785, he was removed by with his mother firs by the said Ray into the Town of Alexandria and Commonwealth of Virginia The said Ray removing from Maryland into Virginia to settle and carrying the said Slaves with him, and [illegible] was when he was about four months old sold, at a sheriffs sale to the defendant in consequence of which the said to defendant took possession of the said Plaintiff and held him as a slave in the State of Virginia for five years and upwards. Whereupon the Counsel for the Petitioner Plaintiff prayd the Court to instruct the Jury that if they believed the evidence so as aforesaid given to the Jury to be true as above stated that in that case the Plaintiff became intitled to his freedom under the Laws of Virginia unless the defendant should satisfy the Jury that [ink] that the said Ray complied with the the exceptions in the said Law of Virginia was [ink] exceptions or some of the exceptions in the said Virginia Law. But this Court refused to give the instruction prayed From which opinion and [illegible] refusal the Plf. by his counsel excepts and prays that this his ref exception may be seald which is done accordingly.